This simple yet satisfying drink is loved by kids and adults alike. Easy to make, this method eliminates the need to pit the watermelon, therefore saving you time and energy. 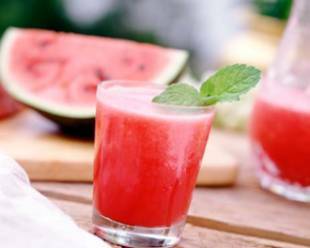 Instructions: Put the diced watermelon and 2 cups of water in a blender, blending until the black seeds break up (2 minutes). Let the seeds settle to the bottom. When pouring the liquid into a pitcher, leave the seeds at the bottom, then discard them (no strainer needed).